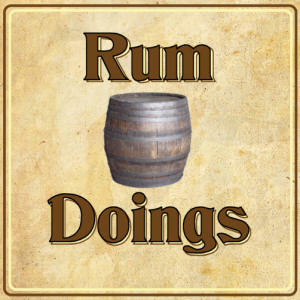 Welcome to Rum Doings 34, what must be the most interrupted podcast of all the podcasts that we have podcasted. This week we’re not talking about whether CCTV cameras have made our lives safer. Imbibed is a black cherry soda, which we risk drinking without protective goggles. And then within mere minutes the first phonecall arrives. And a cat. We attempt to explain BP’s real crime, and then the phone rings yet again. Listen in to Nick’s conversations! Be slightly bemused by what’s going on! Don’t call John’s mum! A period of no interruptions features chat about Richard Herring, ordering wine, and ketchup. And then there’s a knock at the front door. We then sniff a baby. Who becomes our very special guest, chattering away into the microphone, so quietly we couldn’t hear it ourselves at first. There’s some actual content when we talk about DVDs, piracy, and DRM. And why some businesses insist on telling their shareholders how badly they’re doing. Propel us into international fame. Tweet it, Facebook it, do whatever it is you young people do. And writing a review on iTunes helps us a great deal. If you want to email us, you can do that here. If you want to be a “fan” of ours on Facebook, sigh, you can do that here. “A period of no interruptions…” – That’s not the Rum Doings way. HFCS is not more dangerous than sugar. It’s a silly myth produced by naturalists who like to think that the root of all evil is that which is produced in a lab. The problem with HFCS isn’t that it’s worse for you, but that it’s cheap and can be put into everything. But if the states get rid of HFCS, we’d probably drop our tariffs on sugar cane and end up with the same problem, just with Brazilian cane sugar. It does taste better though. HFCS does taste quite unappealing and, frankly, corny. I’d avoid it for those reasons too. That said, the fact that it *is* added to everything is the problem. There’s no need to add sweetner to half the things in which it’s found, but it goes there by dint of .. I’m not sure what. Cane sugar or beet sugar would be less likely to do have such widespread thoughtless inclusion. It goes there mostly by the dint of the fact that it’s cheap. Cheap meat combined with cheap vegetables don’t taste very good, something is needed to gussy it up. That is where the triumvirate of bad food comes in: Salt, Fat, and Sugar. (Just for fun sometime, try the low sodium Campbell soups. They taste like liquid Styrofoam.) It also helps to stretch ingredients so that companies don’t have to use as much real produce in a product. More liquid products like spaghetti sauce and barbecue sauce are a really good example of this. I genuinely think that cane sugar and beet sugar would be just as likely to see widespread use. Not just because sugar is a cheap substitute for flavor, but also because lots of “foods” on the market exist purely by the grace of sugar. Children’s breakfast cereals, pop tarts, candy bars, and even so called healthy choices like Nutri-grain bars and yogurts. Is there anywhere we can read these PC Format articles of which you speak? Yeah I would like them and anyone saying anything about bad piracy i would just email that article and say someone actually found out that its the other way around. not that they would actually listen. afaik, HFCS isn’t more “calorifically dense” than sugar; they both contain 4 calories per gram. But as Arthur pointed out, the problem is that HFCS is cheap and ubiquitous. Things would certainly *taste* better if fructose/glucose solutions were replaced by sucrose, but they wouldn’t be healthier. I don’t think HFCS tastes corny but it’s certainly harsher than cane sugar. I’ve tasted Mexican & American Coke side by side and the Mexican stuff is undeniably smoother and tastier. It’s important to keep in mind that the “corn industry” is much bigger than sweeteners — there’s the massive starch industry, the oil industry, and the growing biofuel industry. The overwhelming majority of corn grown in North America is used to feed livestock, though, and is thus tied to the price of many animal products (which is more than just meat — the whole animal is used up). It would take an *enormous* effort to see even the tiniest change in US corn policy because of how tightly and thoroughly its tendrils are woven into the American economy. Also, it sounded as if the baby said “hiya”. Haha! Oh, and “down with old media” and other such chants. I’m not reading any above comments, as I’ve not finished the podcast yet, but honestly: I hate grape juice. I get headaches when I drink the red stuff, and I don’t particularly like the flavor of either color. But there are a few Rieslings that I actually quite enjoy, and I may also like Beaujolais, tho I’m not sure if that’s a flavor thing or just an emotional response due to a previous relationship. Anyways, I definitely hate all grape juice I have encountered, and actually quite like some wines. I may be missing the point, but with regards to illegal file sharing networks’ downloads and record companies’ profits peaking at the same time, it does not necessarily imply that the increase in illegal file sharing activity in some way boosted commercial sales (although it is a possibility), as correlation does not imply causation. Rather, there are many separate factors that could result in an increase in both illegal downloads and commercial sales, such as a boost in publicity of a certain band for example. Just thought it was worth pointing out. Grape juice, like all juice, is sweet. I’d hate drinking something sweet with my meal. Though I agree, wine could do with tasting a bit more agreeably.